Say goodbye to rust forever! 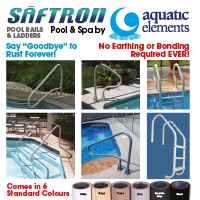 Aquatic Elements proudly presents the Saftron range of Swimming Pool Rails & Ladders. Using Marine Grade Aluminium encased in U.V stabilised Vinyl Polymer Saftron Rails & Ladders gives superior strength & durability & will transform any Swimming Pool or Spa. Saftron Ladders & Rails are made of specially formulated compounds to ensure longevity and unparalleled resistance to weather elements, are UV stabilised and chemically inert while requiring virtually no maintenance. Saftron Rails & Ladders are not required to be earthed or bonded when installed with Saftron’s high impact polymer anchor sockets or easy to use In-ground Anchor or Surface Mount Anchor. Each rail or ladder includes colour matched cover plates for In-ground/Surface Mount installation. Models designed to suit both the Domestic & Commercial Swimming Pool Environment. 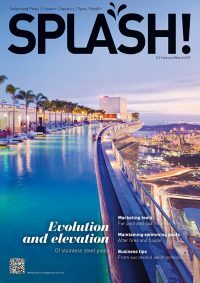 With 6 colours to choose from, there’s a colour to suit any pool environment. Click HERE to view the Saftron range. Contact your state distributor below for more information and to order your Saftron Rails and Ladders.